Date of publication: March 11 2013 . Today our hero remaking is faithful and sometimes indispensable companion - your favorite jeans. It's hard to find a man in the locker room that would not have found a couple - the other jeans. They have everything except are not even grandparents. After all, jeans are comfortable, durable and practical. And sometimes so often difficult to tell them "yet". Is not it? Our advice: do not throw away this unique "couple"! 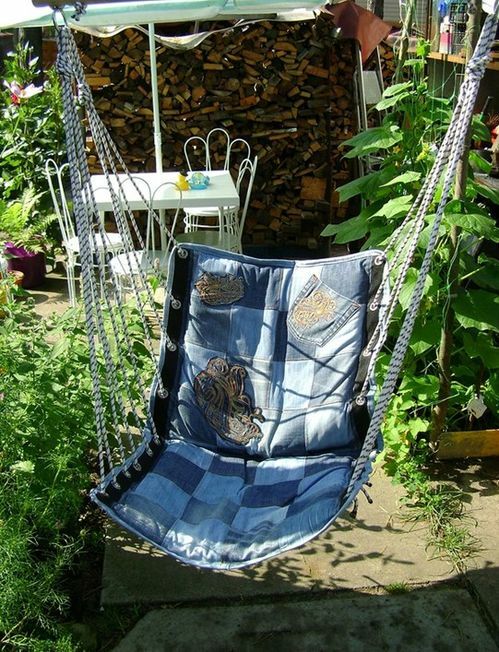 Centuries-old jeans will be the best for you "ally" in the creation of creative and stylish gizmos. And really, that did not come up: cut jeans and shorts produced, sew skirts and warm slippers from «denim» and sheepskin cushions and various bags, fun toys in the nursery and beautiful photo frames, invent covers chairs in the garden, and so on. n. But most importantly, overtighten furniture in the house or at the cottage. 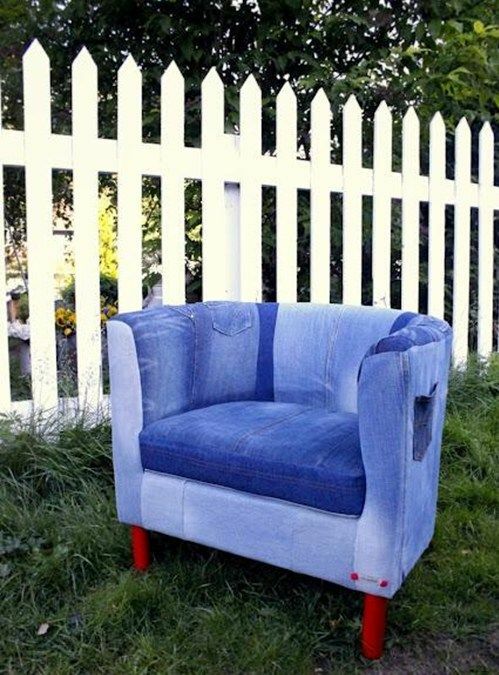 That is to say, give a second life to pieces of furniture and "precious" jeans. After Denim - this is the best solution for ideas. And no need to buy anything, and material quality, does not know the demolition, cute, color indigo. So, a pop-ideas on transforming the chair from IKEA SOLSTA OLARP. This unique creation decorate your terrace in the country, as well as a loggia, balcony. However, you have some work to do and be smart. 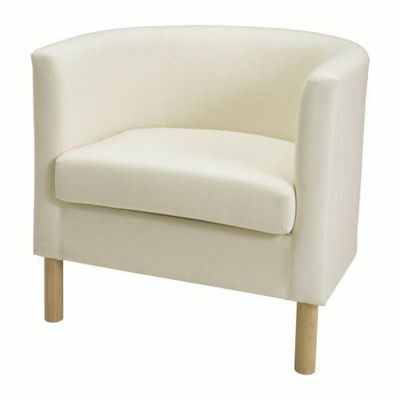 It is this version chair SOLSTA OLARP - RANSTA unpainted need for this alteration. The second element - is worn "favorite" jeans, which may differ both in color and in the degree of wear. So even be more interesting and fun. The first thing you have to take two pairs of jeans and cut them into pieces of different sizes and shapes (just try not too small). Then, using a sewing machine or manually merge all the figures together and they upholster chair. Alternatively, you can sew a custom cover. All at your discretion. Embellish it a fun place to relax so you can: paint the chair legs in bright red, tangerine or yellow. Here's what came of it: the chair from IKEA SOLSTA OLARP feels comfortable in a new image. With a pocket on the side can "play" and make it bigger. It will be useful for newspapers, magazines and small accessories. And our hero can give here such chess and comfortable "friend". Together they would look harmonious. That's the way offer to make a highlight in your interior home and at the cottage in a beautiful time of year - spring by a chair SOLSTA OLARP from IKEA. However, if your attic lying around antique chair and dear to the heart to part with hard object, of course, it is also suitable for this venture.